A few weekends ago, my friend Michelle invited my family to join her’s for an awesome, outdoor mid-January brunch. It was unseasonably warm at the time, which just goes to show how fickle Ohio weather can be. Two weekends ago, 50 degrees and sunny, yesterday, windchill of -10 degrees with flurries. C’est la vie.Getting back to the brunch, Michelle brought me as a gift two pounds of beautiful Meyer Lemons (how awesome is that?). I mean, these little guys were gorgeous – pleasantly plump with a stunning golden yellow skin. I was pretty intimidated though, because they were so lovely yet I knew that they would only last a short while and being that they are hard to come by, I really wanted to make the most of them. 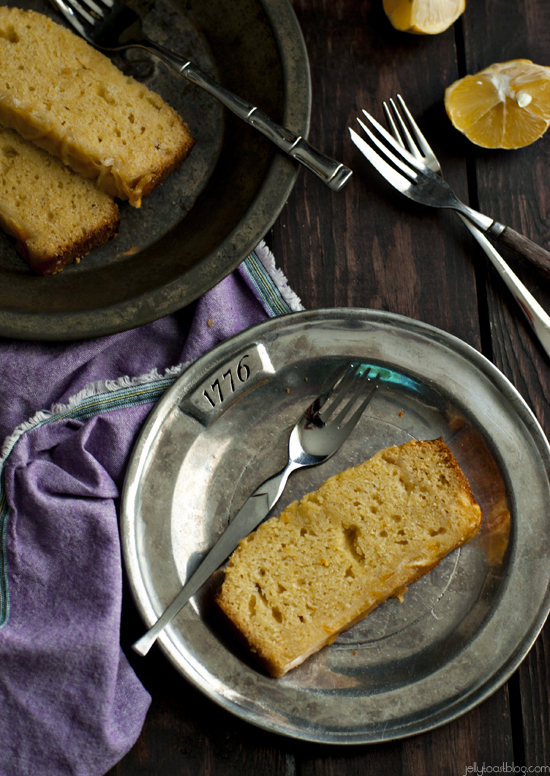 I have to admit that I had never worked with Meyer lemons before (I know, the shame…) so I looked around for a bit before coming up with several recipes to try; one being this upside down cornmeal quick bread. 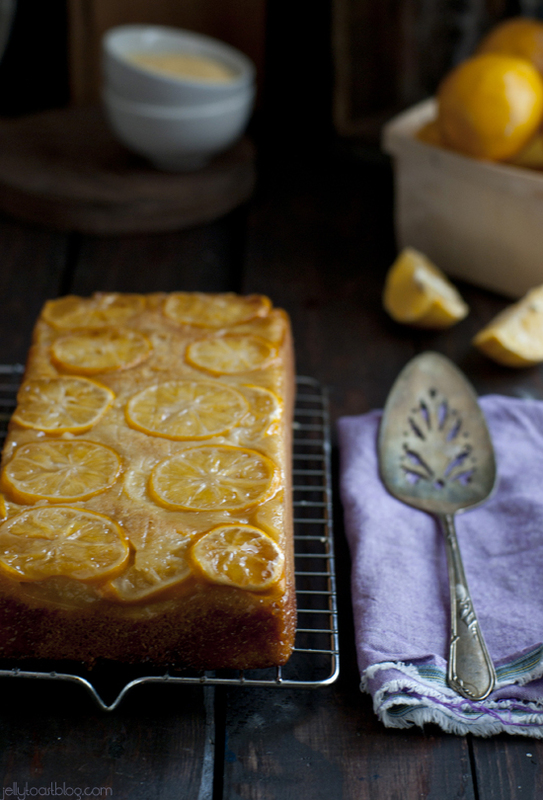 I really wanted to showcase the beauty of these little lemons and I am fascinated with upside down cakes. I mean, they’re like magic. You put everything at the bottom, cross your fingers and hope it all turns out beautifully. And when they do it is truly something to behold. Plus, one of my favorite cookies are cornmeal and lemon so to me, this texture and flavor combo was going to be a sure bet. The results were incredibly mouthwatering. 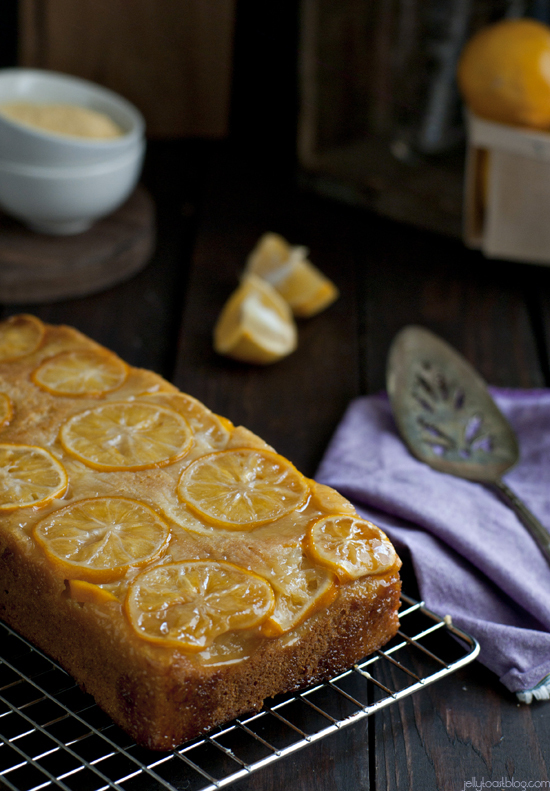 A sour and tart meets sweet cakey-bread treat. In fact, I debated over calling this a cake or a bread, but in the end went with a quick bread description. It’s baked in a loaf pan, after all. While the Meyer lemons are considerably more sweet than a traditional lemon (I ate a whole one by itself to test out the flavor before diving into cooking with them) it is still a lemon and therefore a very lemony tasting dessert. And for a girl who used to steal the lemon wedges of her mom’s teacup saucer at restaurants and eat them whole, a strong lemon flavor is a-okay. The juices from the lemon caramelized a bit with the sugar to create a beautiful, jewel colored top on this striking bread. Next time I make this, I think I’ll even throw in some poppy seeds or ginger. There are just so many things you can do with lemons, let alone these awesome little Meyer lemons. I’m a total convert and will never let another winter season pass without scooping up as many of them as I can. 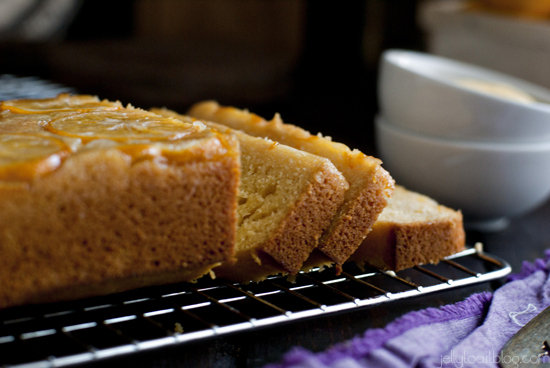 Plus, the unbelievable color of this Meyer lemon cornmeal quick bread added some much needed sunshine to our day. Oh, and did I mention? It tasted awesome. Generously grease a 9×5 loaf pan with non-stick cooking spray. Cut a piece of parchment paper to fit the bottom if the pan and press it into the bottom. Grease the parchment paper. Set aside. Combine sliced lemons, sugar and a teaspoon of flour in a small bowl, tossing to evenly mix. Line bottom of the pan with the Meyer lemon slices. This will probably take two layers. Pour any additional sugar or juice from the bowl over the lemon slices. In a large bowl, whisk together the remaining flour, cornmeal, baking powder and salt. In a small bowl, mix together remaining wet ingredients. Gently pour wet the wet ingredients into the dry and stir until just combined. Bake for 50 minutes or until a tooth pick comes out with only moist crumbs clinging to it. Allow to cool completely in pan on wire rack. When the bread is cooled, cut off an major doming of the top. Run a sharp, thin knife around the edges of the bread to ensure a clean release. Place a plate upside down over the pan and holding both the pan and the plate, flip both over and shake gently to help release the bread into the plate. Discard parchment paper. Holy mother this looks so GOOD Em! You did them justice, my friend! I cannot find Meyer Lemons anywhere 🙁 But I so want this bread in my life. Maybe I’ll try it with some oranges instead..
oooh, I bet oranges would rock in this! Looks lovely! I also cannot find Meyer lemons here. Amber’s idea for oranges sounds perfect though. Maybe I’ll even use blood oranges for a fancy version! 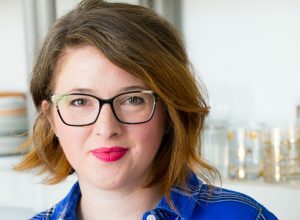 I was so afraid my brain would lock and not let me come up with a recipe to make before mine withered. I totally know how you feel! Thanks for stopping by, Isabelle! I linked to your site as well! Thanks again! Any idea how this bread would freeze?? I have a tree full of lemons!! What a beautiful cake and a beautiful blog. Saving recipe and subscribing.